February 26, 2015 - Brief highlights from Paul George's first full practice with the Pacers since breaking his leg in the USA Basketball Showcase last August. PG: "I'm Happy to Be At This Point"
February 26, 2015 - Pacers forward Paul George discusses participating in his first full practice and his overall recovery from his broken right leg. February 26, 2015 - Pacers head coach Frank Vogel talks to media about Paul George's return to practice. February 26, 2015: After practicing with the team, Paul George discusses the steps of his recovery and addresses his possible March return date. February 26, 2015: After practice, Paul George discusses what it's been like to watch the team's latest stretch of games. Pacers forward Paul George practiced in full for the first time on Thursday and then met with the media to discuss his rehabilitation from a fractured right tibia and fibula. Above is video of George's complete session with media. 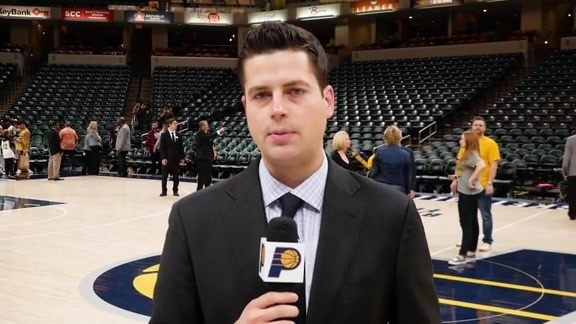 Though George and Pacers head coach Frank Vogel both said that there is no timetable for George's return, but George said he was "very excited" to be back on the practice floor. "To be able to go through a full practice now and go up and down, it's a big step for me," George said. George will likely practice and undergo daily evaluations for the next couple weeks at minimum before he is cleared for game action. When George does return will be up to the Pacers' medical staff. Still, the speed of his recovery from the horrific injury he originally suffered during last summer's USA Basketball Showcase has even George himself in awe. "August 1st, after it happened, I didn't think I'd be where I'm at right now, up to this point" George said. "I don't think anybody would if you had seen what I saw. "But I'm happy to be at this point. I'm happy to be practicing again. Just running gives me a smile, so I'm happy right now." Continue checking back for more videos later this afternoon.